Not available, consider the LaserJet 4350N instead. The HP LaserJet 4350 is a very fast, reliable printer. It comes standard with 64 MB RAM and one 500-sheet tray. Upgrade options include features like network cards, duplexers, and extra trays. 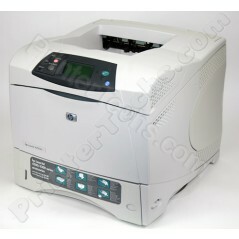 Other models in this series include HP LaserJet 4350N , HP LaserJet 4350TN , HP LaserJet 4350DTN. HP part number is Q5406A. Not available -- order the LaserJet 4350N instead. Call us with any questions toll-free 866-352-7108 or local 608-831-2396.